Here are some examples of how Phillip CFD can help a client maximize returns and minimize losses. Definition: An order combining the features of stop order and limit order. Once the stop price is reached, the stop-limit order becomes a limit order to trade at the pre-determined limit price or better. However, there is no guarantee that the order will be filled in the event the price gaps through the limit price, the order will not be filled. Usage: To enter a new position or exit an outstanding one when the price surpasses a particular point. Can also be used to take profit or cut down on losses upon reaching the stop price. The buy stop-limit order is triggered when the stop price hits $3.90. A limit order to buy the counter is a limit price at $3.95 will be submitted and will be executed at $3.95 or better price. The sell stop-limit order is triggered when the stop price hits $3.85. 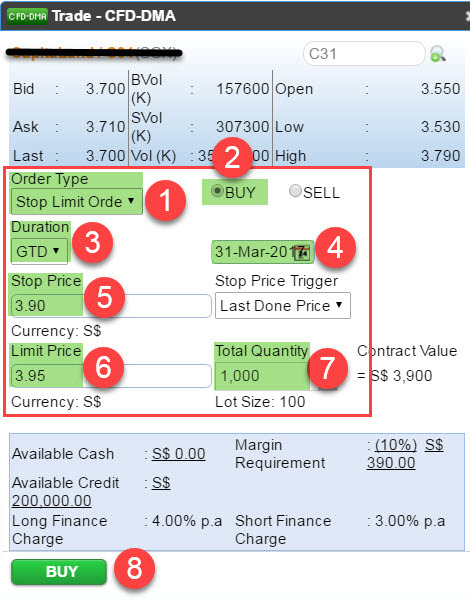 A limit order to sell the counter with a limit price of $3.80 is submitted and will be executed at $3.80 or better price. The buy stop-limit order is triggered when the stop price of $0.740 is hit. A limit order to buy the counter with a limit price of $0.750 is submitted. However, the market price of the counter gaps to above the limit price of $0.750, thus the order remains unfilled. Definition: An order stipulating that if one part of the order is executed, the other is automatically cancelled. A limit order is set at $3.90 to take profit and a stop-limit order is set at $3.40 to cut any possible losses. The OCO is triggered when the limit order at $3.90 is executed, cancelling the stop-limit order to sell at $3.40, which might otherwise be triggered when the price of the counter drops to $3.40. A client takes up a long position on Counter ABC at $1.12. He submits an OCO order consisting of a limit order to sell at a limit price of $1.14 and a stop-limit order to sell at a limit price of $1.06. The market price of the counter starts to drop rapidly afterwards, and when the market price hits $1.06, this executes the stop-limit order, which in turn triggers the OCO to cancel the limit order with the limit price of $1.14. Usage: This order is commonly used as an automatic measure to protect gains and reduce losses on outstanding positions. The trailing step is set at a certain % below current market price. When the price moves up, the trailing step will move up correspondingly as well. If the price comes down, the trailing step will remain at previously indicated stop price. Once the current price is the same as the indicated stop price, the indicated limit price will be sent out to the market. The trailing step is set at a certain % above current market price. When the price moves down, the trailing step will move down correspondingly as well. If the price comes up, the trailing step will remain at previous indicated stop price. Once the current price is the same as the indicated stop price, the indicated limit price will be sent out to the market. Client A takes up a long position on Counter A and buys at $0.60. He submits a trailing stop order of 10%, which puts the initial stop price at $0.54. The market price increases to $0.74, and the new stop price is now 10% lower at $0.67. The market price falls to $0.69 but the stop price remains at $0.67. As the market price is still higher than the stop price, the order is not triggered. The market price increases yet again to $0.81, bringing up the stop price to $0.73. The market price drops to $0.73, which is the stop price, and this triggers the trailing stop order. A limit order of $0.73 is automatically submitted to sell the counter. With the trailing stop order, Client A’s gains from the counter have been automatically protected from fluctuations in the market, as indicated above. Definition: An order that is not activated until the parent order is executed. Usage: To execute orders that are structured of 2 more steps that must occur in a specified sequence. The parent order must be executed before the rest of the orders are executed. A limit order to sell SIA at $14.90 is executed. This triggers the ‘If Done’ order to buy SPC at a limit price of $6.40. 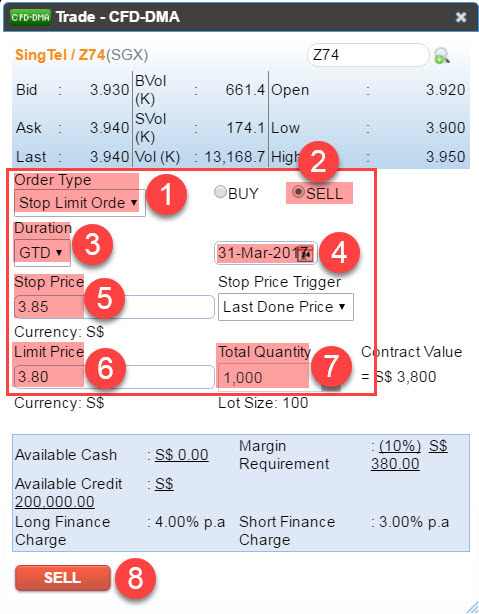 The limit order that was submitted by the ‘If Done’ order is now executed to buy SPC at S$6.40. Definition: An order that is executed only when certain conditions of the security, or another security, have been fulfilled. Usage: To enter a new position or exit an existing position when the stipulated security reaches the targeted price range. A contingency order is set to sell NOL at $1.43 if the Bid Price of NOL equals to or is less than $1.43. The contingency order is triggered and a limit order is sent when NOL hits $1.43 and the order will be executed at $1.43 or better. A contingency order is set to sell Singtel at $3.13 if the Bid Price of another security, StarHub, equals to or is less than $2.89. When this condition is fulfilled, a limit order to sell Singtel is sent and the order will be executed at $3.13 or better.